Want to know if your buckets are food grade? Checking is easy, just find the recycling symbol and cross reference with this article. 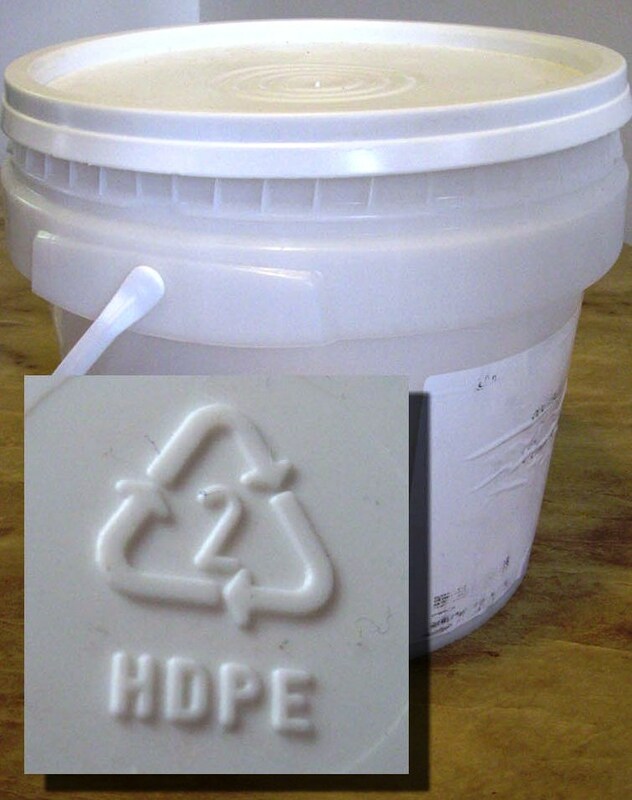 The best food grade buckets are HDPE, symbol #2. 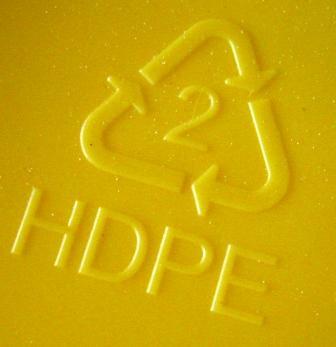 HDPE represents high-density polyethylene. The molecules of HDPE are more tightly packed and stable than other food grade plastics, meaning less plastic can leach into your precious food stores. 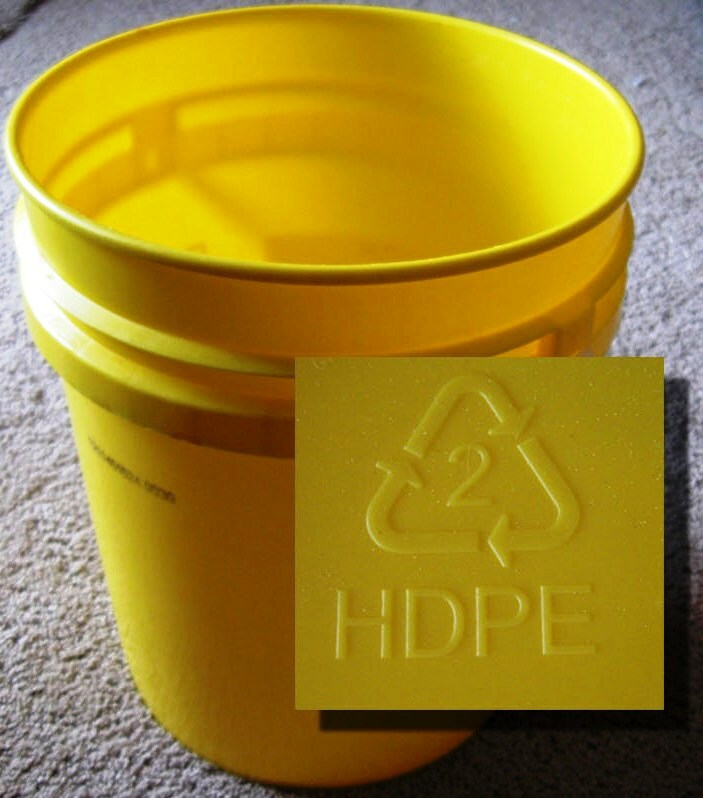 HDPE also builds a better bucket since it’s a very sturdy type of plastic. 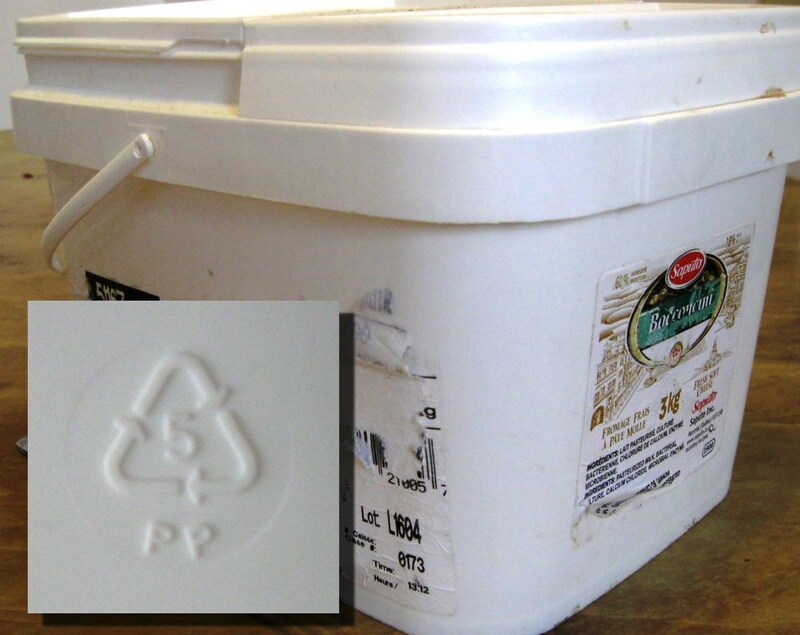 One of our readers points out that not all HDPE pails are automatically food safe. He links to an article which I’ll paraphrase. There is a common misconception that all containers made of white plastic or HDPE plastic bearing recycle symbol 2 are food grade containers. This is not true. If a container is not clearly labeled as “food safe” or being made of food grade plastic, then you should assume that it is not food grade. 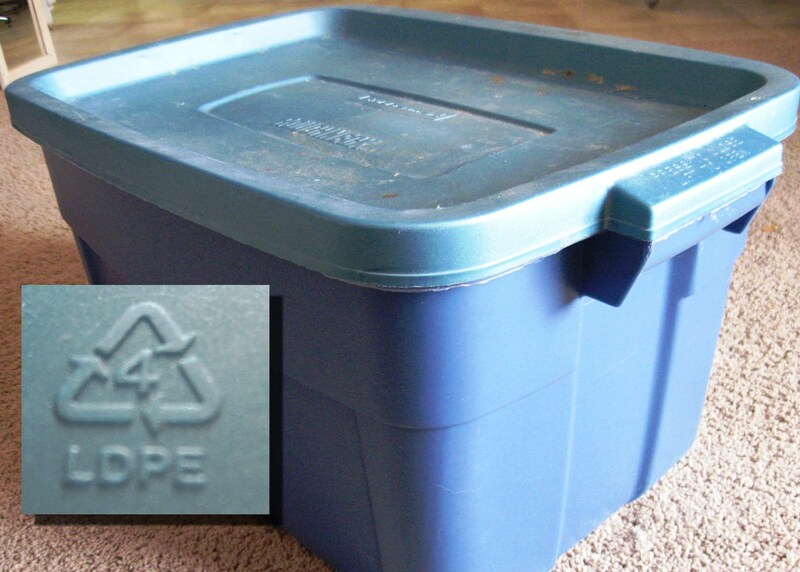 Check for clues that an HDPE container is food grade. Has it been used to store food in the past? Is it labeled as food grade? It’s even possible that a bucket is made with food grade plastic but has been colored with toxic dyes. Other food grade plastics bear recycle symbols 1, 4 and 5. They are also known by their abbreviations PETE, LDPE and PP. For your benefit, I’ve cataloged every bucket I could get my hands on. Based on just the recycle symbol, they all seem to be food grade, but I’d check with the manufacturer of the storage totes before using them for direct contact with food. Here’s us using these LDPE bins for mixing waffle batter. I use these every day for my 5 gallon bucket computer desk. These great little 1 gallon tubs which originally held Bocconcini cheese. So we can be quite positive these are food grade although they are nowhere labeled as food grade. And finally a sturdy standard issue 5 gallon bucket. A note about PETE: This plastic type is usually reserved for single use drink containers. If you use PETE drink containers multiple times you do risk plastic leaching! I haven’t seen PETE used for buckets before, but if you’ve found an example, send it in! A note about PP: The Environmental Working Group classifies polypropylene as a low to moderate health hazard. This may apply mostly to cosmetics that include polypropylene as an ingredient. But you may think twice before using PP when you have other choices. You can read more about these plastic types, including details about their temperature tolerances, on the food grade plastics article. It’s nice to know it’s a quality bucket but I assume that makes it more expensive. Why would Home Depot waste the extra money? Hi Russ, I’m really glad you let everyone know the plastic type of a Home Depot bucket, since they’re the most popular bucket type in America. HDPE plastic may be more expensive but home depot sells their buckets for really cheap because they have their logo all over them. They actually sell an white unbranded bucket which is exactly the same make but costs much more. Home depot wants to get their little five gallon billboards out there as cheap as possible so people will know about them and buy lumber and stuff from them. And if they make them high quality, people will use them for many more purposes. Rona sells a blue 5 gallon bucket, but no one uses them because they are leaky and low grade. RE: Home Depot Homer buckets. This is incorrect. A number 2 does not mean that the plastic is automatically food grade, it means that it is HDPE and *may* be food grade. You must also look at the binders and release agents used in the bucket making process as food grade ones are more expensive. Thanks for letting me know about this. I hadn’t considered that dyes or other additives could make any bucket non-food safe. I’ve updated the article to include your link. Anytime. Thanks for the great blog! This total article should be deleted! Someone is going to get poisoned if they do not read properly, Reconstruct your information to properly cove HDPE!!!! The site that Derek M. Posted has some great info. we get food buckets in all the time. 3 through 7’s I would not use for food storage. the plastics become very brittle in an outdoor or unregulated indoor enviroment. The #2 will also become brittle over time I believe the photo degredation is 6 to 9 months. That’s really helpful information, do they become brittle from sun exposure? #2 HDPE is not food grade unless stamped food grade, and I have not seen one yet that is both HDPE & food grade. I called the maker of Home Depot buckets -the name escapes me at the moment- and was specifically told they are not food grade. So, for a buck or two, I simply use mylar bags in my orange HD buckets to remove all doubt. In my opinoin, they’re the best buckets around. The mylar insert is a great idea. The manufacturer is Leaktite, in Leominster, MA. They manufacture both the orange Homer bucket from HD, as well as the more expensive “food grade” bucket available on the HD site (not in stores). About 5-bucks apiece if you buy 10. Lowes does sell a white food grade bucket. It is clearly marked as food grade. I did notice that our home depot now sells gamma lids! So, now we get the buckets at Lowes, the lids at Home Depot and spread the wealth around. I understand the concern about storing food or water in a “non-food grade” bucket. But what about use of the inexpensive Home Depot buckets for the construction of Sand Filters for emergency water filtration? The water passes through the sand in the bucket in about 30 minutes. Any significant health risk in that? Preppers want to know! This is a very difficult question to answer. It really depends on the pail itself. Generally there will be more leaching if food is stored in the pail for long periods. Things to consider is the sand filter will actually scrape the pail and could expose more of the plastic to the water you’re filtering. Other factors that can play a significant role are temperature and pH of the water. All that being said, the filtered water that you consume over a few days is not likely to contain enough contaminants to be of concern. I would definitely wash the container a few times before use. I had emailed the company (Leaktite), have experience with food grade containers through professional cooking and designing said containers. Food safe and food grade are not the same thing. HDPE plastics may be used for dry good for a short period of time, but are not recommended for liquids or fatty materials. What does that symble reflects either recycled or can be recycled……? Yes, any “recycling symbol” means that part can be recycled. Hi, i am looking reusable , stack able, 40 kg tub/bin for fresh fish transportation ( 30 kg fish & 10 kg ice) for upto 12-16 hrs transportation . initially i need 1000 pcs /month. water proof and inert . it should meet ASTM standard. Any body out there help me on it? So this means we should not grow tomatoes and peppers in the orange Home Depot buckets? Interesting question as I have been wondering about the Homer buckets advertised from Home Depot, O5GLHD2. I would like to grow tomatoes and peppers also in buckets as we live in an apartment complex. It does have a balcony. 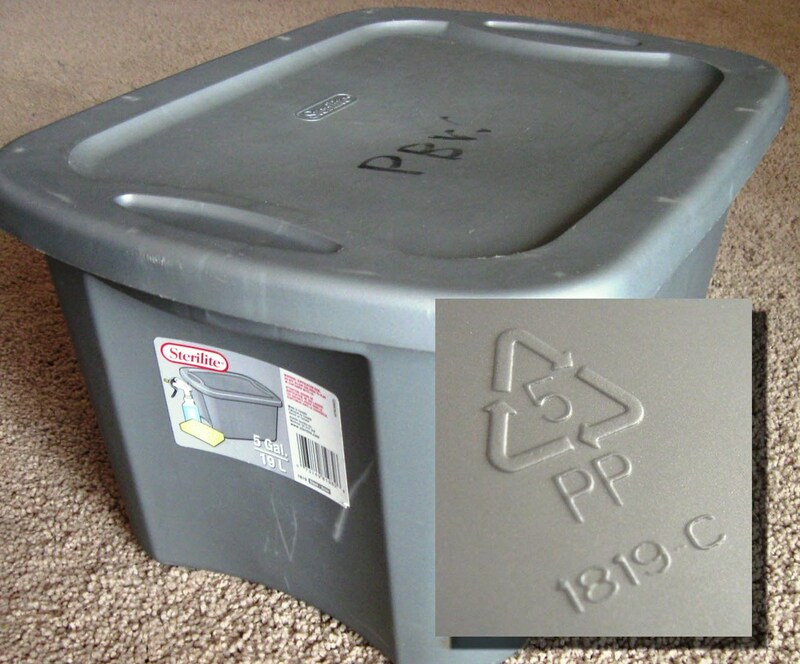 What are the sizes of the grey LDPE rectangular bins and where do I get them ? 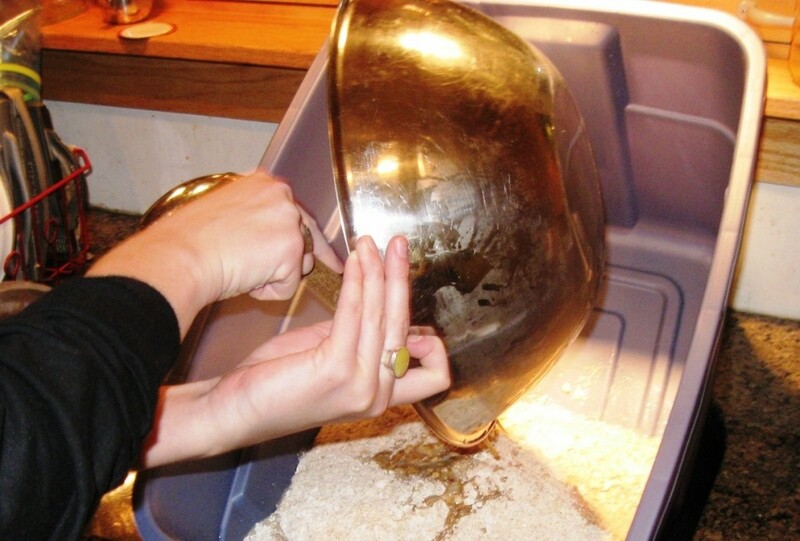 I need one 20x10x10 as inner mash tun for sparging, instead of a false bottom …. thanks in advance!